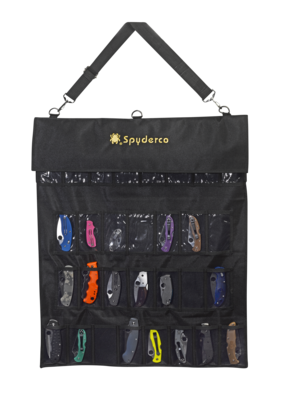 SpyderPac™ Large - Spyderco, Inc. Page 144 – Spyderco, Inc. Constructed from heavy-denier polyeste Cordura, the pack has thirty deep pockets sized to hold even larger folders. Each pocket is fronted with a clear plastic window for viewing knives tucked inside. It tri-folds over and seals closed by way of a Velcro strip running the width of the pack. The knives remain secure and separated in their pockets and cannot rub or scratch against each other. 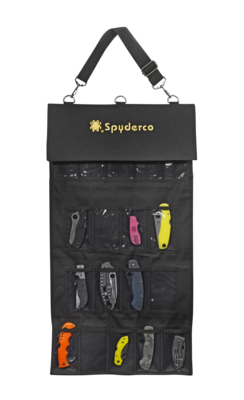 An adjustable length shoulder strap attaches with two durable steel D-rings letting you hang the pack for display on a wall or sling it over your shoulder to take with you. Spyderco's name and bug logo are embroidered in gold thread on the closing flap. Available in black.